WINNER World Tour, Taken Over LA as Well! WINNER has proved their global popularity in Seattle and San Francisco as well as Los in Angeles, the third city for the North America Tour. 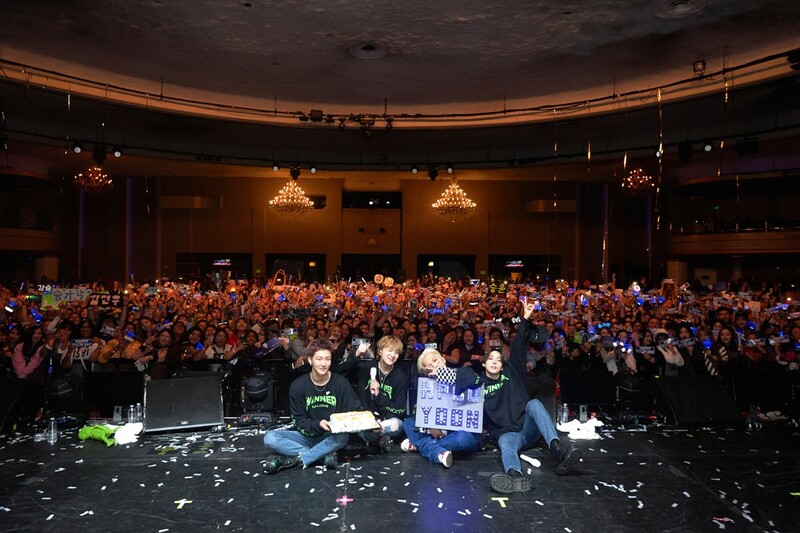 Winner held ‘WINNER EVERYWHERE TOUR IN LOS ANGELES’ at HOLLYWOOD PALLADIUM in Los Angeles on the 20th. In particular, Kang SeungYoon sang the ‘Youth’ of Troye Sivan, which was not on the set-list, and received a great response from his fans as he presented it as a surprise gift to the fans in the theater. In addition, on the day of performance, it was Kang SeungYoon’s birthday in KST so he was able to make unforgettable memories in the United States by celebrating his birthday. After the group photo shoot, the fans impressed Kang SeungYoon by showing the slogan with the phrase “Happy Yoon Day” and sang birthday song together along with the birthday cake. After the birthday song was over, the members made a humorous and amusing atmosphere such as burying the face of SeungYoon in the cake, and the fans were able to laugh. Winner, who finished the stages, thanked the fans endlessly and pledged to try their best to comeback. Even after the concert, Keang SeungYoon thanked by saying, “It was the best birthday, thank you to L.A fans. I will never forget your lovely smiles and beautiful voices. I love you all”. Winner, who performed in three cities in the western United States, will move to Dallas on the 22nd. They will go through the Chicago on 24th and Canada on 27th, and will finish up their North America Tour in New York on the 29th.